I have been meaning to ask. If anyone gets the chance to test this out for me I would be fascinated to hear the results. It's a dual cavity experiment. I think it would require a klystron or twt with a continuous phase. Cylindrical cavities should work. They would need to have a gap between the two of them of 1/4 lambda wavelength with their phase out of alignment by 90 degrees or pi/2 radians. What should happen is the plate of cavity 1 should have circulating current stimulated by the radiation inside that builds up depending on the Q of the cavity. Information is limited by the speed of light so that appearance of current should be on its way to the next cavity which has its current out of phase by 90 degrees. When the information reaches cavity 2 the current in cavity 2 should appear to be moving with cavity 1 so it is attracted. Cavity 1 on the other hand when the signal reaches it appears to have its current moving against cavity 2 and should be repulsed (similar to current in wires). I would guess this effect should also scale with the Q of the cavity. It may be possible for a dielectric to slow the information transfer between the cavities and move them closer together and increase the effect. I would guess some radiation may tunnel through the cavities into the other one and attenuation of one cavity may be required to keep them equal in amplitude and out of phase by 90 degrees. My guess is it should be similar to attraction between magnets but the force is in the same direction for both cavities. Images attached for ease of understanding. 8, 9, 10, 11 are frames of current over time. Frame 12 is a repeat of frame 8 and frame 13 is a repeat of 9. (Only 4 frames needed). The illustration of force between wires can parallel to the cavity plate I think. I am back with an updated draft after some terrible news around about NASA dismissing these researches. They should not as, otherwise, it could happen as with Galilei having his detractors even not trying to look in the telescope, just dismissing on faith. I have analysed the case of the frustum and the results appear to be striking. One must admit that geometry comes to rescue not just general relativity. For this particular geometry the cavity can be made susceptible to gravitational effects if your choice of the two radii of the cavity is smart enough. This is something to be confirmed yet, just my theoretical result, but shocking anyway. As usual, any comment is very welcome. These equations appear rather interesting as, by a proper choice of parameters, one can make a gravitational effect more or less relevant in the physics of the problem. It is the case to say that geometry comes to rescue. Just what this "proper choice of parameters" is, it is not spelled out in your paper, so I will follow my interpretation of your equation. Now, if this is correct, this is a rather peculiar, surprising geometry: it says that the axial length of the truncated cone should be close to zero while the radius should be as large as possible, in other words, the geometry should be as close to an almost perfect cylinder (small cone angle) with very short axial length, and with flat faces. In other words, this optimized geometry, according to Eq. 39 in your paper seems to be much closer to Cannae's device. However (see below), we also conclude that the maximum possible values of the constants b (and also a) are extremely small and hence they are negligible unless the EM Drive happens to be near a magnestar. The "lo" constant is a really huge number (unless, as you state the EM Drive happens to be located next to the field of a magnetar, which is certainly not the case, I might add, since the closest magnetar SGR 1806-20 is located about 50,000 light-years away from Earth ). we conclude that the maximum possible values of b (and also a) are extremely small and hence they are negligible unless the EM Drive happens to be near a magnetar http://en.wikipedia.org/wiki/Magnetar. Thanks a lot for spending some time on my calculations. You tried with b but did you check for a? Also l0 contains the density of energy of the electromagnetic field (the constant U0 squared). In any case, I am aware, as my colleagues, that general relativity could not be enough. My aim is to explore this approach to evaluate the magnitude of the effects in play. If such an effect would be confirmed by independent measurements at other NASA labs, as stated in the news, it would mean that we have to cope with something real new. It would be a great result. Otherwise, Baez and others will have reasons to laugh. Yes, I also obtained a proof for "a" which is similar to the proof for "b". 1) I am not in my office now to reproduce my proof for "a" (it is in another computer) but please let me know if you would like me to post the proof for "a" when I get back later today. I did not calculate the magnitude of "lo", I took your word that it has a very large value unless one is close to a magnetar. 2) It would be helfpful if we could "put meat on the bone", could you please estimate a numerical value for "lo" (length in meters) so we can have a numerical idea of the small size of this effect ? Thank for spending the time to publish your report, as the only way to understand the claims of the researchers is to conduct detailed analyses like yours. Is there a way that Wolfram Alpha can give X'mn which are needed for TE modes ? OK, yes, that's helpful to the people that have Mathematica. They can program that function ( notice that X'mn is not a buil-in function in Mathematica yet). To those that don't have Mathematica, that's the great usefulness of this link http://wwwal.kuicr.kyoto-u.ac.jp/www/accelerator/a4/besselroot.htmlx: it gives X'mn to 15 digits accuracy and it is accessible to everyone. 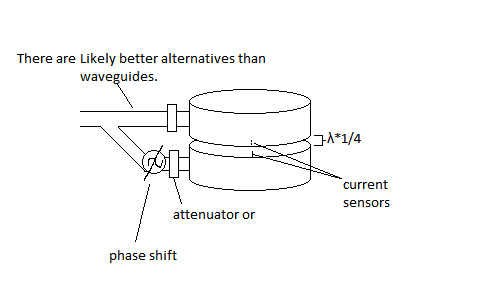 Assuming that EagleWorks can set up a magnetron powered experiment that is substantially more precise than Shawyer's, the force can be expected to be proportionally less. There's also a good chance that it would point in the opposite direction. So it is imminent that Shawyer will need to disregard such results, so he started saying things like "Obviously I'm very happy for Nasa, they're having great fun, but it's not really real science," Shawyer told IBTimes UK in an exclusive interview." (from an older article). Aside from such declarations, what I regret for is a dismissal a priori of an object really easy to test, with just few bucks. 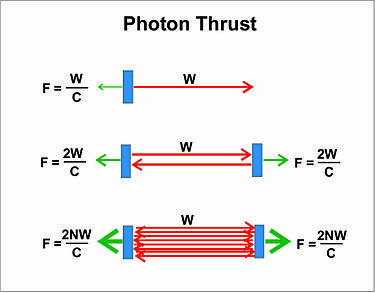 At the time of cold fusion scientific community was much more open minded. Important labs tried to repeat the experiment with the help of Fleishmann himself. Now, there are nor secrets neither patents at stake. It seems like we learnt to behave like Bellarmino at Galileo time where it was far too easy to look at the sky with the scope, but hard to admit to have been wrong and dismiss a lot of acquired "knowledge". Roger Shawyer, the British scientist who invented the highly controversial electromagnetic space propulsion technology called EmDrive, has said Nasa's work is encouraging but still far behind many private firms working on it already. "Obviously I'm very happy for Nasa, they're having great fun, but it's not really real science," Shawyer told IBTimes UK in an exclusive interview. "Obviously I'm very happy for Nasa, they're having great fun, but it's not really real science,"
Shawyer told IBTimes UK in an exclusive interview. is a very strange quote (for Shawyer to be quoted in http://www.ibtimes.co.uk/nasa-validates-emdrive-roger-shawyer-says-aerospace-industry-needs-watch-out-1499141 as saying that "NASA is just having great fun, but the experiments at NASA are not really science" in Shawyer's opinion). Which companies are the many private companies (besides SPR) working on EM Drive that are far ahead of NASA in the opinion of Mr. Shawyer ? If, what NASA is doing is just "great fun" but "not real science" in Shawyer's opinion, in which peer-reviewed scientific journal have these EM Drive "real scientific experiments" that Shawyer is referring to, been documented? I have plotted with Maple the function bb(c)=(1-c^2)/(4*c^2*ln(c)) and I have found the figure I enclose. There is no maximum whatsoever. 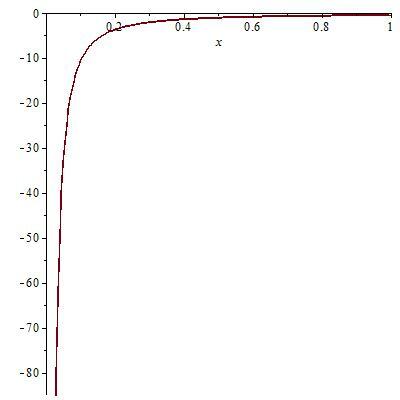 This curve has an asymptote at increasing c and another for c going to zero. This is what I meant saying that geometry comes to rescue. I am currently working out all this with Mathematica and I will update my draft as soon as possible with realistic values. Of course, my take remains the same as yours, if the effect exists Einstein theory could not be enough. has said Nasa's work is encouraging but still far behind many private firms working on it already. Believe Shawyer was saying that EWs efforts, using EM Drive to search for a QV theory proof, was not about understanding the EM Drive nor testing it properly. Will be very interesting to see what Shawyer and others post in 2015. Incorrect results follow from plotting variables over incorrect range of values of the variable. The variable "c" valid range of values is from 1 to Infinity, instead of from 0 to 1 as you plotted above. Take a gander at my proof http://forum.nasaspaceflight.com/index.php?topic=36313.msg1375279#msg1375279. One has to assume that either r1 is smaller than r2 or that r2 is smaller than r1. In your paper ( http://forum.nasaspaceflight.com/index.php?action=dlattach;topic=36313.0;attach=830137 ) you assumed that r1 is smaller than r2, both in the integral and also in the expression showing the term (r2-r1)/h, in your equations 34 and 38 of your paper. in order for r1 to be equal or less than r2, c must be equal to or greater than 1. Instead you have plotted c for values smaller than 1. Your plot shows values for c in the wrong range. c is defined to have values from 1 to Infinity, instead of from 0 to 1 as you plotted. The values of c smaller than 1 you plotted are in conflict with the assumption that r1 is smaller than r2 (which was explicitly defined). To be consistent with the assumption that r1 is smaller than r2, you should plot values of c equal to or greater than 1. Aside from such declarations, what I regret for is a dismissal a priori of an object really easy to test, with just few bucks. It's not a-priori. It's a-posteriori. We didn't know a-priori that it does not work. 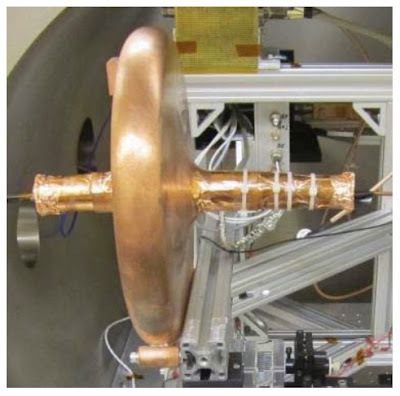 We know from direct measurements that EM fields behave in a specific manner, down to parts per trillion. Momentum which is carried by an electromagnetic field can be measured directly as the field strength, with far greater precision. This knowledge puts a very low upper bound on the net momentum that EM fields can acquire and exchange with the cavity. Hence the knowledge that his drive does not work is a-posteriori knowledge. If his force was in low nano or pico newtons range, it would have been an a-priori assumption. At the time of cold fusion scientific community was much more open minded. Important labs tried to repeat the experiment with the help of Fleishmann himself. Scientific community's open mindedness towards a claim depends mainly to the claim itself. Now, there are nor secrets neither patents at stake. It seems like we learnt to behave like Bellarmino at Galileo time where it was far too easy to look at the sky with the scope, but hard to admit to have been wrong and dismiss a lot of acquired "knowledge". How can you compare a person who received a grant from the British government to Galileo? We know from direct measurements that EM fields behave in a specific manner, down to parts per trillion. Momentum which is carried by an electromagnetic field can be measured directly as the field strength, with far greater precision. This knowledge puts a very low upper bound on the net momentum that EM fields can acquire and exchange with the cavity. We also know that a high Q cavity of say 50,000 will do 50,000 bounces of the em field, each adding to the generated force. Shawyer's Force equation of (2 Po Df Q) / c clearly states Q is the way the EM Drive multiplies the very low force of one way to a much higher value. Your assumption is not needed as this function retains his sign independently on your choice. In any case, there are not extrema and this function runs to zero on the right and runs to minus infinity on the left. You can verify yourself that the function is symmetric under the exchange r1<->r2. I am not comparing this guy to Galileo, rather I consider that, in this case, a real small effort by a couple of serious labs can decide if he is a charlatan or not. Sorry, but we cannot have a logical, mathematical discussion where you first write equations where r1 is assumed to be less than r2 (as Eq. 34 and 38 of your paper) and now you proceed to show a graph with a range of variables in conflict with YOUR assumption that r1 was smaller than r2. That is inconsistent. Incorrect results follow from inconsistencies in formulation. 1) make a plot of the geometry of the truncated cone you have in mind: clearly showing what you define to be r1, r2, h, and the z and r coordinates of your truncated cone. 2) explicitly show what is the optimal geometry of the truncated cone, as per your paper. The big end most certainly should be convex and the small end concave, relative from the outside of course. The big end and small end radii should not be coincidence but offset having the small end radius much larger than the big end. In fact, it might be better for the small end to be flat. Sorry, but you cannot consistently first write equations where r1 is assumed to be less than r2 (as per your paper) and now proceed to show a graph in conflict with YOUR assumption that r1 was smaller than r2. That is inconsistent. Incorrect results follow from inconsistencies in formulation. I am not arguing against my paper. You know may take. I am questioning your proof based on a functional form that has the mathematical properties I have shown. I know by myself, and I stated it in the draft, that here we are working with really small values. As you can see, I have not attempted any computation of a force, if any, or thrust. I am thinking about this and I am trying to work with real values. But please note also that this is a function of three independent variables: r1, r2 and U0.